Outdoor Vitals is a Utah-based gear manufacturer who has come out with a selection of hammock-specific gear items. I was able to test their Solo Plus hammock, diamond tarp, and multi-function bug net over the past few weeks. Outdoor Vitals hails from Southern Utah, where I grew up, so it was very nostalgic to see my old stomping grounds (Zion, Kolob, Virgin) in their press materials. The hammock comes in a few varieties, but I think the Solo Plus is the sweet spot. It’s 10 ft (3m) long, and the perfect width to eliminate any floppy fabric on the sides but still have enough for a diagonal lay. The open style, gathered-end hammock uses a single panel of fabric and includes a stuff sack that amply stores the hammock and the included suspension. The webbing straps use a high-quality “seatbelt” style weave and have sewn loops on both ends. The included wiregate carabiners make clipping from the strap to the Whoopie slings a breeze. No fancy knots to learn or toggles to mess up. The tarp uses a lightweight silpoly fabric in two panels to create a diamond shape. The edges are sewn with grosgrain and there are loops with line locks on each corner for rapid adjustment. Included with the tarp are stakes and guylihe. It has fully-taped seams. The bugnet has a unique design that incorporates a no-see-um mesh on top with an ultralight and breathable fabric on the underside. It’s a tube-style format that you pull over your head and cinch on one side. The bug net comes with some shock cord and cord locks that can be used to make a make-shift, adjustable, and flexible ridgeline that can be used on hammocks (like the Solo Plus) that lack a fixed ridgeline. Over the past few weeks I’ve been using the Solo Plus hammock almost exclusively as my go-to indoor bed. The single panel design is very comfortable and the lay is solid. It doesn’t have too much stretch that I barrel out, which is nice. The fabric has a soft hand and packs easily into the includes stuff sack with room to spare for the suspension. Speaking of the suspension, there are a few ways you can attach it to the hammock, so there is some variety there. I preferred to put the Whoopie Slings directly on the ends of the hammock and use the carabiners to connect the strap to the adjustable loop. The bug net has a very unique and ingenious design that I haven’t seen before. By intentionally using lightweight but breathable fabric on the bottom and also adding a DWR treatment, the fully-enclosed net does triple duty as bug protection, weather shield, and weather cover. It’s modular and can be flipped to provide more privacy and moisture control as well as heat retention in the winter. It’s a one-stop net. I did find that over extended use there were a few spots along the seam between the netting and the DWR fabric that split. The inside has an unfinished hem and I think the stitching just wasn’t reinforced well enough. It’s a tradeoff when making ultralight gear, but I think a different sewing process may eliminate that weak point. The pull over, tube style design is one I highlighted many years ago. It’s okay to use, but it’s not the easiest to get in and out in a hurry. It’s also easy to lose the pull string, so some thought on the users part to keep it tucked away helps make it easier to find later. Thankfully, the draw string is so light and small that you can just pull the fabric down open the netting without manipulating the cord lock. I wish the tarp were truly square. The catenary edges are nice on square or hex tarps, but I’m not sure they add much on a diamond pitch. I also wish there were more tie-outs so I could have more pitching options. And last, but probably most important to me, was that the Ridgeline was floppy. Because the seam didn’t go across the ridgeline, the fabric became floppy along the center line. This is due to how the bias of the fabric was long the ridgeline, and with the grosgrain edging preventing further edge stretching, the fabric in the middle can’t get taut. This can become a rain basin in big storms, and snow shedding is more difficult. Overal, the design, build, and price points and all favorable factors for this kit. The tarp is really the only element that had any real downsides. Suspension and Anchor System ★ ★ ★ ★ ★ I’m pleased that the hammock comes with the suspension — really good suspension–that is fairly easy to use (the slings require a little training). Construction and Craftsmanship ★ ★ ★ ☆ ☆ Mass-produced, but even stitching and clean look with well thought-out features. No loose threads. The bug net has unfinished seams on the inside. 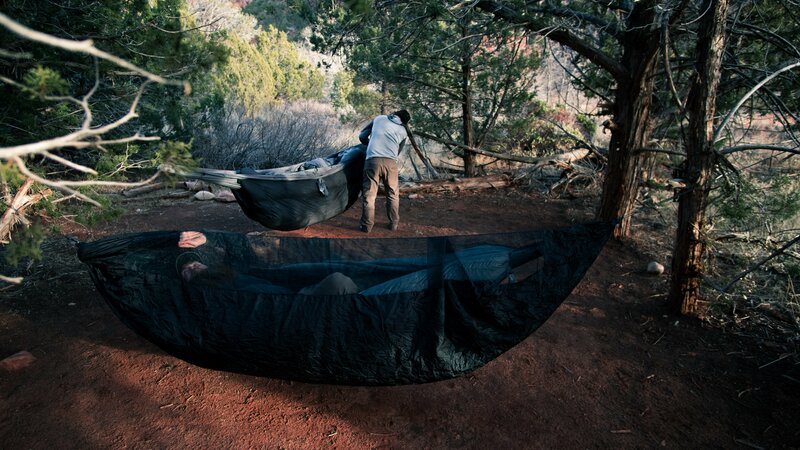 Modularity ★ ★ ★ ★ ★ As an ultralight kit, this system is remarkably modular — as are all open style hammocks. The bug net can rotate and provide more or less protection. Price and Value ★ ★ ★ ★ ★ The hammock is a steal with all the included accessories. The bug net and tarp are also well priced for the material and craftsmanship.